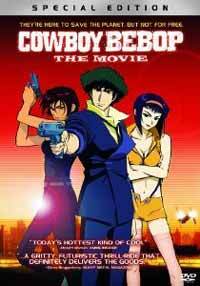 Notes: This is a side story set within the milieu of the Cowboy Bebop TV series, roughly between episodes 22 and 23. The crew of the Bebop is pursuing a bounty on Mars, but things quickly turn ugly as an explosion unleashes a biological weapon upon the Martian populace. As Spike and company delve deeper into this mystery, a man named Vincent emerges from the shadows, and soon the crew is in for the fight for their lives. But what can they do against an opponent who may already be dead? I really like Cowboy Bebop. The characters, the universe-building, the music, the animation, it's all an intriguing, enthralling, and excitingly imaginative ride. So the first time I sat down to watch this movie, I was surprised to find myself losing interest and walking off, despite all its obvious pros. It took me a while to compose myself and come back to watch it a second time. Overall, I've probably watched this movie three times, but only once all the way through. Considering the glittering record this movie has on other review sites, I found myself wondering if I was even watching the same movie as everyone else. Was I just getting impatient with the franchise, or was there actually something to this movie that everyone else is willing to overlook but me? And then I figured it out. You see, Cowboy Bebop is a series that prides itself on fantastic realism. Futuristic technology that looks beat-up and old ... and cities that may rest on asteroids, but still look like cities. Initially, it's the setting that sets me off; Mars just doesn't look right to me as portrayed here. While the Moroccan village is an interesting addition to the fray, it is effectively a mere distraction from a Martian city with a full-sized river, where it only rains by the virtue of weather control machines. (And if it doesn't rain here, why are there storm gutters?) Things seem to unravel one by one -- such as the complete inability to explain the complete and utter lack of modern flying craft in the background (when they were obviously being "rented out"), compounded by the usage of vintage aircraft as a deus ex machina near the end of the film. This strikes me as completely jarring and out of place, especially given that some of the models of aircraft used aren't even extant in the here and now! At least everything looks gorgeous, as we've come to expect from this franchise, but the concept is just not as well-fleshed-out as I'd hoped. As they say, the devil's in the details, and a lot of details got missed here, when they weren't in the series. The biggest letdown, though, is in the characterization. Vincent is perhaps the single weakest antagonist in Cowboy Bebop's canon, since his motivations are at best nebulous, and his personality is little more than that of a cypher. The "Bond girl" of the day, Electra, is little more than an archetype, and seems to be there more as a placeholder than as an honest-to-goodness character. If they get anything right, it's Spike, who is at his best in this film. Unfortunately, his near-death experience is going to draw more thoughts of "uh oh, not again" rather than genuine excitement. Admittedly, knowing that the Bebop crew has some more time left chronologically after this film's plot robs this film of pretty much its entire suspense potential. Does this mean that Cowboy Bebop: The Movie is poor-quality? Hardly. The animation is superb, the action sequences are exciting, and the Bebop crew is as interesting as ever, though the plot of this movie relegates the crew to virtual cameos, preferring to focus on Spike's physical arts of derring-do and Faye being what Faye is. The music, of course, is outstanding, but I do admit to missing "Tank" at the opening, because it just didn't feel right. That's pretty much the gist of why I can't give this as high of a rating as others might. Sure, it's good, but the movie lacks the consistency and excellence that pervades the television series, and ends up falling a bit short even in comparison to the individual episodes. Cowboy Bebop: The Movie feels less like a story in its own right, but more like a revival piece that celebrates, but does not quite equal the original. While it is too visually excellent to be an average movie, the lack of cohesion in setting and characterization mean that it falls short of excellence, and may leave the most devoted Bebop fans a bit wanting and non-fans wondering what the fuss is really about. Recommended Audience: Due to several rather violent scenes, I would hesitate in recommending this to anyone under sixteen. Realistically, teens should be fine, but parental discretion is certainly advised.